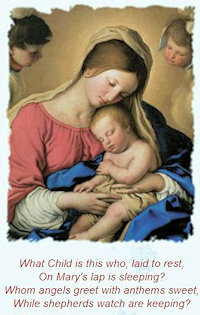 A collection of Activites, Customs, Prayers, Blessing & Hymns to help families celebrate the true meaning of Christmas. Catholic Culture invites you try out some of our suggested activities as you gather around the Christmas tree. Throughout this wonderful time there will always be much hustle and bustle, shopping and baking and gift giving. But we hope you will refer to the Catholic Culture calendar often for ideas and spiritual nuggets to increase your Christmas joy. 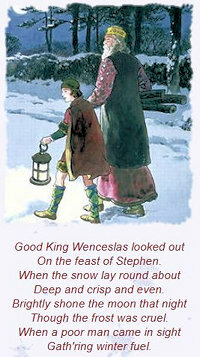 Hymns written specifically for the feast of Christmas have been around, it seems, almost as long as the feast itself. Many of these early hymns were created for and added to the Divine Office, and weren't widely known. Some of these early hymn-writers included St. Ambrose, Prudentius, and Venantius Fortunatus, Bishop of Poitiers. 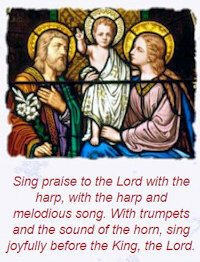 We offer a sampling of beautiful Christmas carols to enhance the celebration of this glorious feast. 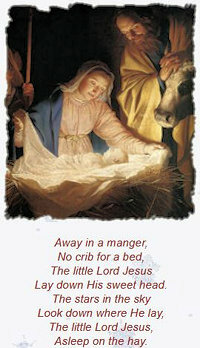 For more carols please see The Hymns and Carols of Christmas and the Music Library. 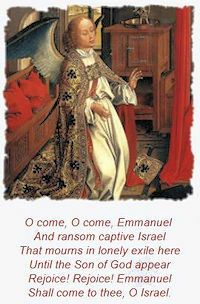 "O Come, O Come, Emmanuel" is an Advent hymn with Christian Latin tune name "Veni Emmanuel" (Come God with Us.) Its history originates in the medieval Roman Catholic Church, c.12th century. It was translated into English by John Mason Neale (1818-1866). 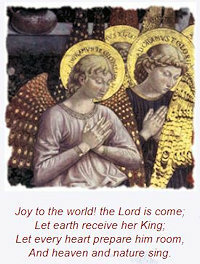 During the Advent season, the hymn began as a series of Antiphons. Each of the Antiphons greets the Savior with one of the various titles He is referred in the Scriptures, names such as "Emmanuel," "Lord of Might," "Key of David," and "Rod of Jesse." The text melody was originally a Plainsong or Gregorian Chant, which is the earliest form of singing in the church. During the 19th-century there were Anglican ministers and scholars who developed a keen interest in translating into English many of the ancient Greek, Latin and German hymns, and made available the rich heritage of these Greek and Latin hymns. John Mason Neale was one of them. Thine own from Satan's tyranny. In A.D. 129, Telesphous, Bishop of Rome, ordained that, "In the Holy Night of the Nativity of our Lord and Savior, all shall solemnly sing the 'Angel's Hymn.' 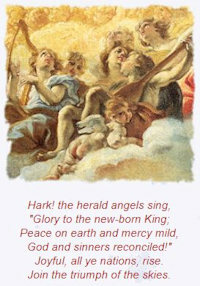 " With that proclaimation the 'Angels Hymn' became the first Christmas hymn of the Christian church. 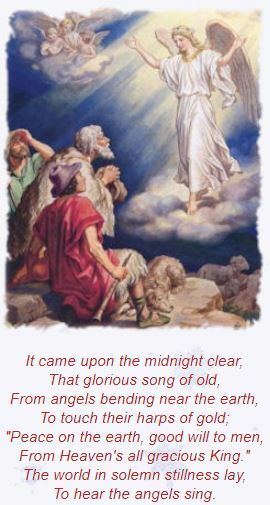 Its most common English version was translated in 1862 by James Chadwick, and its most memorable feature is its chorus Gloria in Excelsis Deo!, which is Latin for Glory to God in the Highest. The Christmas carol Hark! The Herald Angels Sing is written by Charles Wesley, the brother of John Wesley, an early leader of the Methodist church. Rich in scriptural references, the carol speaks of the mystery of the incarnation of Christ. Many scholars belive it to be one of the best songs in the English language. "And suddenly there was with the angel a multitude of heavenly host praising God, and saying, Glory to God in the highest, and on earth peace, good will to men (Luke 2:13-14)." The tune almost always used today was composed by Felix Mendelssohn in 1840, for his cantata Festgesang, written to commemorate Johann Gutenberg and his invention of the printing press. The Christmas carol We Three Kings of Orient Are was written by Reverend John Henry Hopkins, Jr. in 1857 for a Christmas pageant. 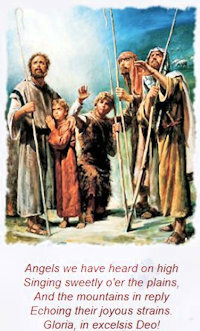 Guided by the star, the Magi traveled to the place where Jesus, Joseph and Mary were staying. They presented their new born king with presents of gold, frankincense and myrrh. The first gift of gold identified Jesu as king, the second gift, frankincense, symbolizes his priethood, and the third gift, myrrh, prophied of his death, as myrrh was commonly used as an embalming spice in that day. 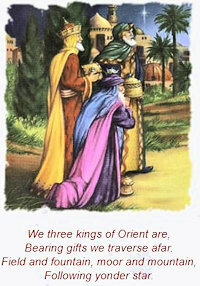 The three offices of the Messiah, Prophet, Priest and King, were also represented by the gifts. 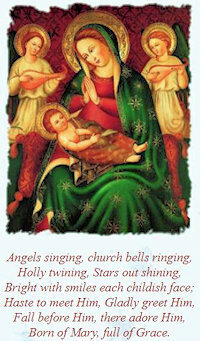 O morning stars, together, proclaim the holy birth! As Phillips Brooks approached the village of Bethlehem on Christmas Eve, 1866, he imagined the Holy Family on their journey nearly two thousand years before, walking over the very same stones, toward the tiny town. Brooks was overcome by the beauty and peace of Bethlehem and his experience inspired him to write this song. 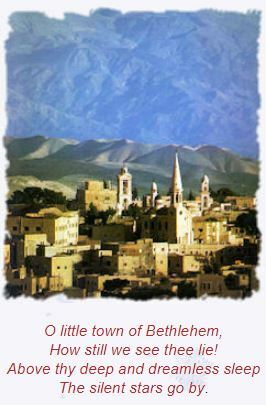 He claimed that the Holy Land was "still singing in [his] soul" when he wrote O Little Town of Bethlehem for a children's Sunday school class two years later. On Christmas Eve 1868, Brooks, rector of Holy Trinity Church in Philadelphia, asked the church organist to set his verses to music. The next morning, Lewis H. Redner brought the completed hymn to church, where the children's choir sang it for the first time. People still call this delightful song "Luther's Cradle Hymn," and believe that Martin Luther sang his own children to sleep with it in the 15th century. None other than the song's composer, James Murray, promoted this charming fable. We really don't know who wrote the words, only that they appeared anonymously in a Lutheran publication called Little Children's Book for Schools and Family in 1885. When the music first appeared in a children's hymnal two years later, it was entitled "Luther's Cradle Hymn." James Murray, the editor of the hymnal, wrote that the song was "composed by Martin Luther for his children, and still sung by German mothers to their little ones." Murray, who was a student of Lowell Mason (Joy to the World), then added his own initials to the end of the song, thereby ensuring over a century of confusion. Raise, raise a song on high, The virgin sings a lullaby. What Child Is This? is a carol written by William Chatterton Dix in 1865, to the tune of Greensleeves. In the original version, each chorus offered a new text. Greensleeves is also used as the tune for The Old Year Now Away Has Fled, which is dated 1642. "The melody Greensleeves is so old that it's impossible to date. In the thirteenth and fourteenth centuries, Mystery Plays – dramatizations of biblical stories – were quite popular. A favorite play topic was Jesus' birth. These events were often orchestrated by singers, writers, and musicians. John Francis Wade wrote the original manuscript. Wade, a Roman Catholic, lived in Douay, France, where he earned his living copying and teaching music. Composed between 1740 and 1744, the hymn became quite well known locally. Adeste Fideles became popular among Roman Catholics during the latter half of the 18th century, and traveled to England by way of the Portuguese Embassy, which performed the hymn regularly at its services. Frederick Oakeley's English translation followed almost 100 years after the original words. Also a Roman Catholic clergyman, Oakeley was a Canon of Westminster Cathedral in London. 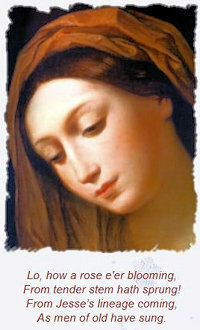 The translation probably helped the carol become popular with non-Catholic singers. 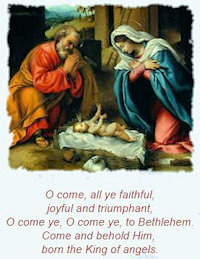 The carol is commonly sung today both in English and in Latin. 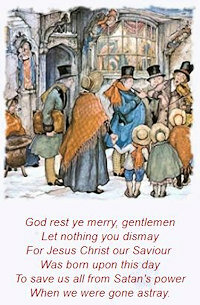 Compared to many traditional carols, "God Rest Ye, Merry Gentlemen" is a fairly recent addition to the world's library of Christmas songs. It originally existed in the many versions sung by paid holiday street singers known as "waits." First published in 1827, it was later used by Charles Dickens in "A Christmas Carol." The good cheer and warm wishes of this carol being sung on the street incites contempt in the crotchety, yet unconverted, Ebenezer Scrooge. This rousing Christmas favorite is lifted by the voices of friends and relatives every year. 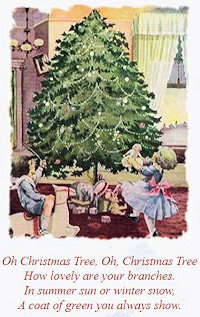 A Tannenbaum is a fir tree (die Tanne) or Christmas tree (der Weihnachtsbaum). 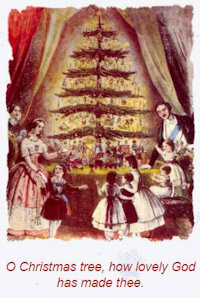 Although most Christmas trees today are Fichten (spruce) rather than Tannen, the qualities of the evergreen have inspired musicians to write several “Tannenbaum” songs in German over the years. The best known version was penned in 1824 by a Leipzig organist named Ernst Anschütz. The melody is an old folk tune. The first known “Tannenbaum” song lyrics date back to 1550. A similar 1615 song by Melchior Franck (1573-1639) goes: “Ach Tannebaum, ach Tannebaum, du bist ein edler Zweig! Du grünest uns den Winter, die lieben Sommerzeit.” There are at least a dozen English versions of this carol. Folktales describing how evergreen trees came to symbolize Christmas can be found in nearly every culture. Centuries-old lore describes evergreen trees blooming in every forest on earth the night Jesus was born. Though history is laden with wicked royalty, this titled ruler stands tall: King Wenceslas. His kind heart was silenced by a jealous brother in 929, but, centuries later, his memory surfaced as the subject of a children's song written by John Mason Neale. Edmund Hamilton Sears was a Unitarian minister and graduate of Harvard's Divinity School. His original writings came to the attention of Oliver Wendell Holmes, who praised him highly. Sears, who preferred a quiet life among his New England congregation, emphasized Jesus' message of "peace on earth, good will toward men." 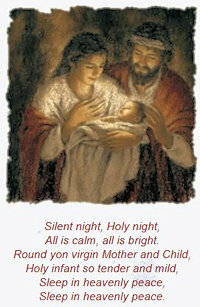 The message of "peace" rings throughout this carol, as it rang in the hills around Bethlehem on the first Christmas. The words to It Came Upon the Midnight Clear first appeared in print in 1850 in theChristian Register. By contrast, composer Richard S. Willis led a very public life as an editor and critic with The New York Tribune. A student of Mendelssohn and a musical journalist, Willis composed carols while acting as a vestryman at The Little Church Around the Corner in New York City. 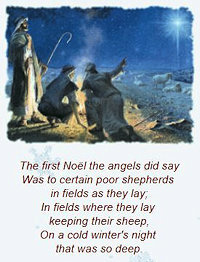 The music of the carol we sing today was actually written for another carol, While Shepherds Watched Their Flocks by Night,and was matched with Sears' words several years later. Although Sears and Willis were from similar backgrounds, they never met. Originally published in 1582 (or 1588) in Gebetbuchlein des Frater Conradus, this 19-stanza Catholic hymn's focus was Mary, who is compared to the mystical rose praised in the Song of Solomon 2:1: "I am a rose of Sharon, a lily of the valleys." The hymn is believed to have originated in Trier, and once source stated that on one Christmas Eve, a monk in Trier found a blooming rose while walking in the woods. He placed the rose in a vase, and placed it before the altar to the Virgin Mary. Some sources indicate the hymn might date back into the 14th Century.